As you can see, Lava Rock is a black, sheer colour with purple pearl. I like this one, it has that glowy quality that really reminds me of lava. Also, as the Konad shows, Lava Rock is sheer and needs 2 coats to acheive opacity - the Konad was just barely opaque enough to show up over Angora Cardi. As the photos also show, I had slight application issues with this one, but nothing serious - it was probably just my noob skills more than anything else. The sad thing about this though, is that Lava Rock chipped on me within a day or two, which was really heartbreaking, since I do love this colour so. I don't know if it's just this colour, or Barielles in general, or just that I got a dud though, as this is the only Barielle I have (gasp, I know. But hey, US stuff is hard to get here). 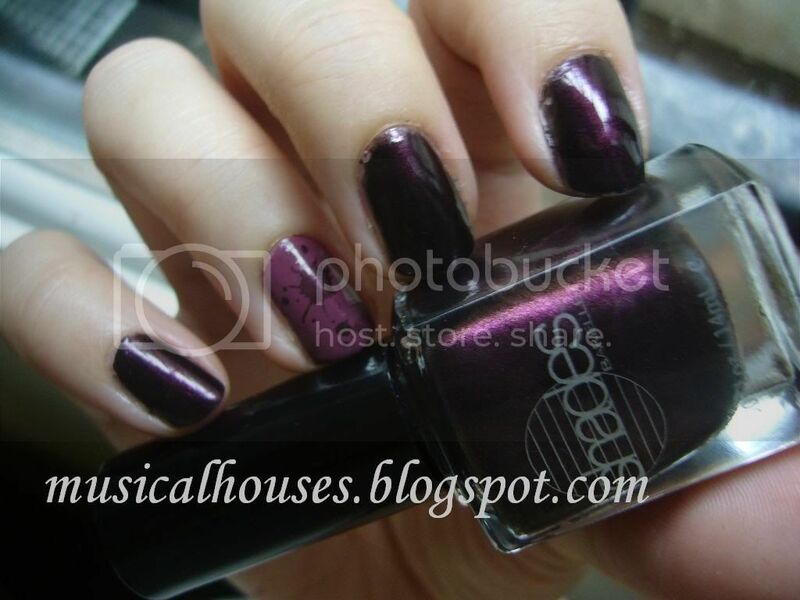 Essie Angora Cardi is also a gorgeous mauve colour that is just deep enough to really make it pop. I love this, it's mauve and it's boring and mumsy, but somehow I like it. I don't know why. I love it, I really do. This one had no application issues and had good staying power - I had to take off my mani because the Barielle was getting all chippy on me, but Angora Cardi was still fine. Ahh, Essie, why do you bother to do three gazillion pinks and sheers when you work the dark colours so well? Please stop producing yet more Marshmallows and Ballet Slippers and Mademoiselles - much as I appreciate sheers in a work setting (because they're not noticable enough to garner snarky comments from mean co-wokers, and because even if they chip noone will really be able to tell) we have enough of them! Come on Essie, us nail fanatics are your greatest customers! Angora cardi was a big lemming of mine and I'm waiting for it from a swap!I haven't tried Barielle yet but I love the combo!Lava rock reminds me a bit of Zoya Yasmeen! Wow nice nails :) how did you do that splatter? yum, I love that rich purple color! also love the konad splatter design. definitely on my to-buy list! Ooh, I've been eying Lava Rock for a while. I might need to place a Barielle order since I don't have any - this is so pretty on you! I recently picked up Angora Cardi - I had looked at it several times and I finally decided I needed it, because it was too pretty to pass up. I think the combination of the two looks great! Love it! Angora Cardi is so awesome! So is the Barielle, btw. Love the formula of Barielle. Sooooo very true about Essie's array of pinks & nudes - it's overwhelming! I think I'll look into Barielle, never tried it before, and the color up there looks fab on you! This nail polish looks so pretty!